These young Auburn lovers are registered at Jordan-Hare. 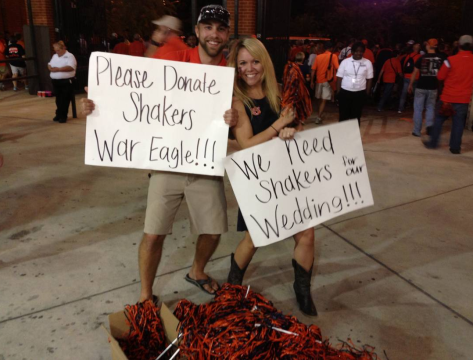 After the game: New Day indeed—there’s no way in hell any Auburn fans would have risked jinxing their marriage by handing out 2012 shakers. Related: Toomer’s after Auburn beat MSU. This is brilliant. Friends got married this summer and waited to look for shakers until after the season, not that 2012 shakers would have been any good. They couldn’t find anywhere to buy them in bulk. I believe it ended up being quite expensive to get 500 or however many they did. All they have to do is go to the student section after the game and they can gather up as many shakers as they want.